A communist state is a state whose constitution claims to follow the principles of communism. Its form of government has only a single political party, the communist party. The governance of the state is guided by the principles of Leninism, Marxism, Maoism, or any other form of communist ideology. Technically, "communist state" is a contradictory term. In principle, a communist society is a stateless society. In practice, communist states do not actually refer to themselves as "communist states". They do not consider themselves to be communist societies at present. Instead, their constitutions call them socialist states or workers' states. During the 20th century, a "communist state" came to be understood as any country ruled by a single party and guided by a Marxist–Leninist or Maoist ideology. These countries would also have a planned economy. The ruling class is the working class (the proletariat). Currently, there are five countries that are called communist states. They are China, Cuba, Laos, Vietnam and North Korea. North Korea does not follow Marxism–Leninism, but it is otherwise still considered to be in the same category. 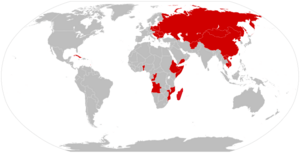 Map of countries that declared themselves to be socialist states between 1979 and 1983. There were, at one time, many countries that followed some type of Marxism. One of the most famous is the Soviet Union. However, many of these are now no longer regarded as socialist. Communist state Facts for Kids. Kiddle Encyclopedia.